The ceremony was held to coincide with the centre’s Macmillan World’s Biggest Coffee Morning. More than £4,500 was raised by staff, patients and families who attended the event or held smaller bake sales on the wards. 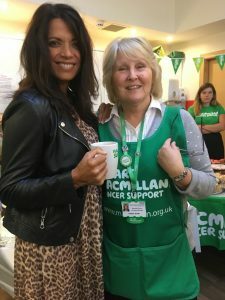 Macmillan Information and Support Centre Manager Debbie Smith said: “We were bowled over by the support from everyone involved. It was great to have our VIP visitors Jenny Powell and Patrick Aherne and the rousing sounds of the Wythenshawe Fianna Phadraig Irish pipe band.